The Competition is the only award programme of its kind to recognise innovative initiatives undertaken by chambers of commerce from around the world. The final rounds under each Competition category are set to take place in Rio de Janeiro, Brazil from 12-14 June during the ICC WCF 11th World Chambers Congress. This category acknowledges chambers proving that education and training are crucial to the establishment, advancement and success of small- and medium-sized enterprises (SMEs); creating more and better quality jobs and boosting economic growth. This category rewards chambers who are helping SMEs and entrepreneurs to innovate and develop their businesses and/or who are strengthening job creation in their respective communities. This category recognises unique chamber projects that are in areas not typically associated with their mission and objectives, creating jobs while enhancing local economies. While more than 70 chambers participated, only four finalists for each category will be shortlisted. In the coming weeks, submissions will be reviewed by an international jury, which comprises representatives from transnational, national and local chambers. The 12 chambers making it to the final round of the Competition will be invited to the Congress to present their initiatives. Presentations will take place before delegates during the three-day event. More than 1,200 participants from over 100 countries are expected to attend. 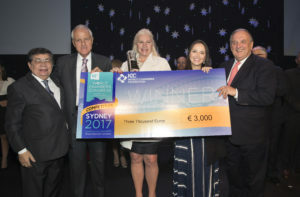 Winners of each category will be announced at the much-anticipated gala dinner, which closes the Congress. The World Chambers Congress is the largest gathering of chamber leaders and their business members. The global forum is held every two years in a different region of the world and provides an ideal stage to share best practices, exchange insights, develop networks and address the latest business issues.